I found this recipe in one of my favorite cooking magazines Simple and Delicious. Not to sound redundant, but everything in the magazine is really simple and delicious! I made these the other night and they were a big hit with my husband and son. I modified the original recipe a little to make it more appropriate for my little guy ( I took out the really spicy stuff). 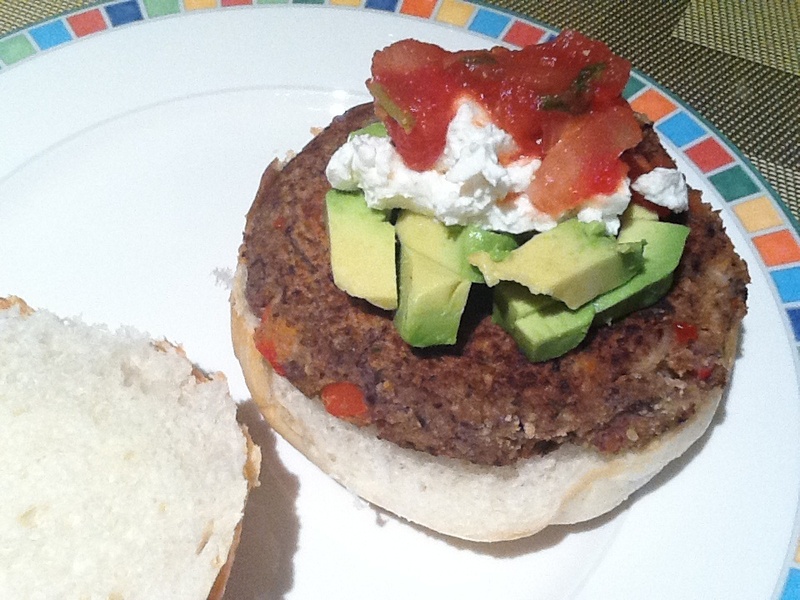 This burger is full of yummy goodness for the whole family. It has protein, potassium, calcium, iron, and Vitamins A and C. This is for little ones 9+ months and mommies and daddies of all ages. Place beans in a food processor, cover and process until blended. Transfer to a large mixing bowl. Add the breadcrumbs, 2 to 3 tblsp salsa, chopped pepper, egg, and garlic. Mix until combined. Shape into 4 patties. Spray a large nonstick skillet with cooking spray and heat over medium heat. Place patties in skillet and cook for 4 to 6 minutes on each side or until lightly browned. Serve on buns. Top with avocado, a spoonful of salsa, and a spoonful of sour cream or plain greek yogurt. Enjoy! And I'm sure these taste better than anything you can buy premade! Looks good! Thanks for sharing.